Toyota created its first passenger car under Toyota Industries in 1936. Later, during the oil crisis in the United States in 1973, Toyota emerged on the American market because consumers were looking to buy more fuel-efficient vehicles. As Toyota’s popularity grew, they developed the Lexus, Tundra, Camry, Solara, Avalon and Scion brands. The Prius, Toyota’s hybrid launched in 1997, is currently the highest selling hybrid vehicle in the world. 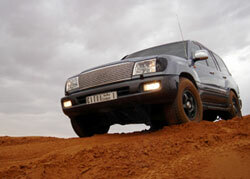 Today, Toyota is the world’s largest automobile manufacturer and dominates the global market. Santa Rosa Transmission and Car Care’s mechanics are highly-familiar with Toyotas and are certified to work on the older, as well as the newer Toyota models. Occasionally we have an older Toyota Tercel come in for service, but typically, our clients have Santa Rosa Transmission and Car Care service their Toyota Truck, Land Cruiser, Prius, Corollas, RAV4 and any of the Scion models....just to name a few. For an appointment, contact Santa Rosa Transmission and Car Care or drop by our location at 1015 Santa Rosa Avenue, Santa Rosa, CA 95404 for a quick look at your Toyota. At Santa Rosa Transmission and Car Care, we’ll be happy to assist you and take excellent care of your Toyota so it can take care of you.